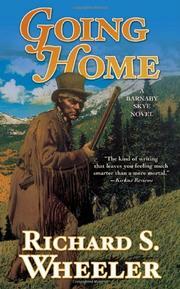 Eleventh in the Western series featuring legendary mountain man Barnaby Skye, by the glorious Wheeler, who has published over 30 richly researched regional novels. As a westerner, Wheeler is a writer’s writer whose prose has the authority of handset type but sparkles like horseshoes on flint rock. In Dark Passage (1998), we saw the aging Skye’s trapping days in the Rockies coming to a close and his heading into Canada to recover his Crow wife Victoria (Mary Quill Woman). Now, as in Rendezvous (1997), Wheeler fills in Skye’s early days and flight west after he deserted from a Royal Navy frigate. Skye’s still wanted by the Navy, and in Mexican California finds himself hiding out in the wilderness, fighting off endless enemies, and sucking life out of leather. The kind of writing that leaves you feeling much smarter than a mere mortal.